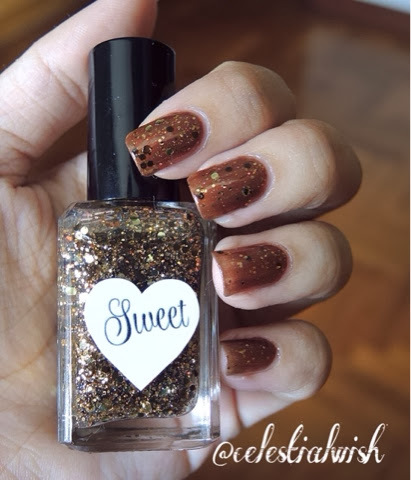 The front view of my nailmail from Sweet Heart Polish! :D Isn't it cute, there's a heart label on the polish & there's sweets beside. It really does make it Sweet Heart Polish eh? 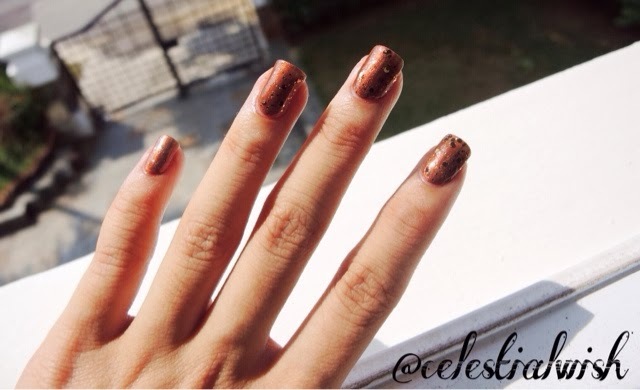 Just look that at that coppery brown colored shimmer polish that Cassandra has formulated for Wheat Penny! Isn't it absolutely stunning? It is a really unique color, first to add into my nail polish collection. The formula is also amazing! It is extremely easy to apply! 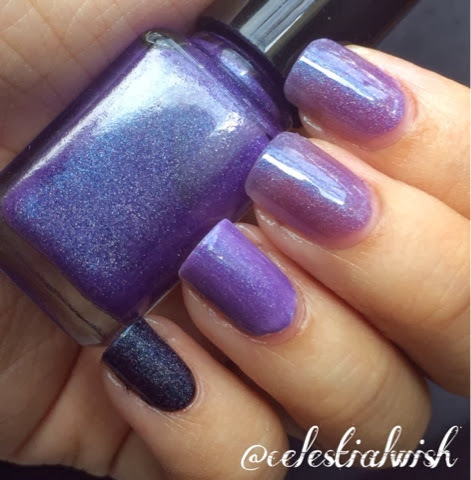 I had on 3 coats of this stunning polish! 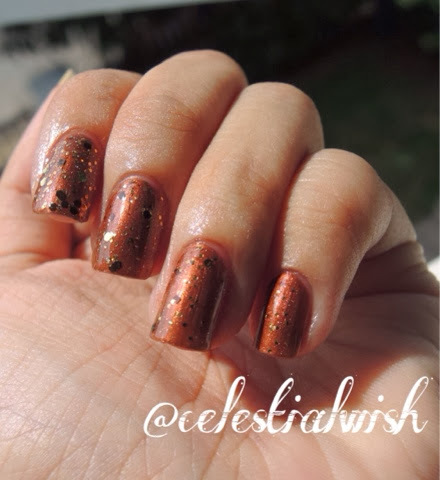 Next we have, Attack of the Crunchy Leaves is a clear-based polish that has truckloads of copper, brown, and gold glitters in different circles sizes. The formula is just like Wheat Penny, amazing! 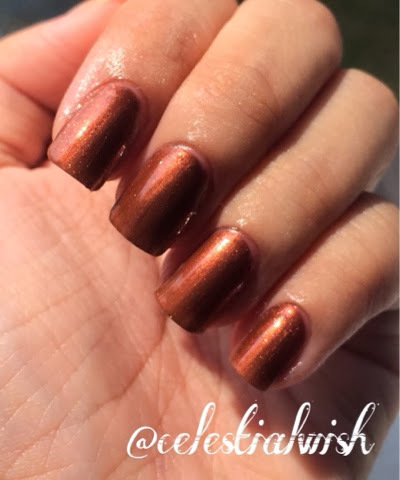 Really love this polish, this set used together is perfect for Fall. If only I could experience Fall in Singapore, that would be lovely. My nails would perfectly match the weather I would be in. I have applied one coat Attack of the Crunchy Leaves over Wheat Penny! Lastly, there is Scarab Shells from "Death Is Only The Beginning" collection! Scarab Shells is a purple shimmery polish. 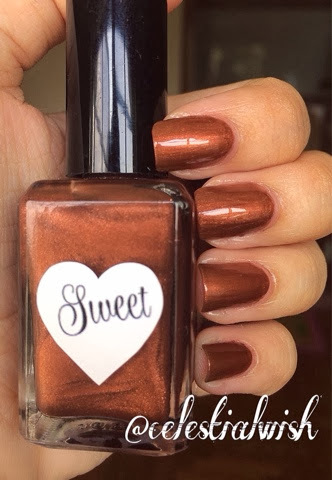 Like all other Sweet Heart Polish, the formula is consistent throughout. 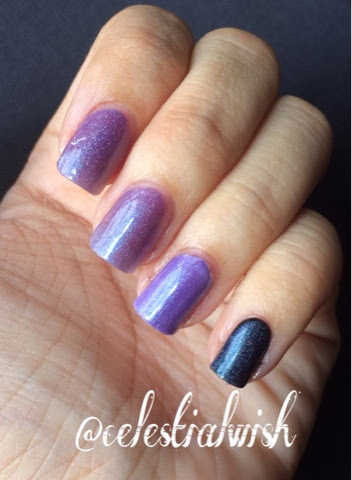 I had 3 coats on all fingers! (The accent and pinky finger had a white and black base respectively. I wanted to see how it would look if I gave them a base, and surprisingly the entire feel came out like it was a skittle!) I find that with the white base, it really bring out the actual color if the polish! It just pops! Will be using a white base when I use Scarab Shell again! 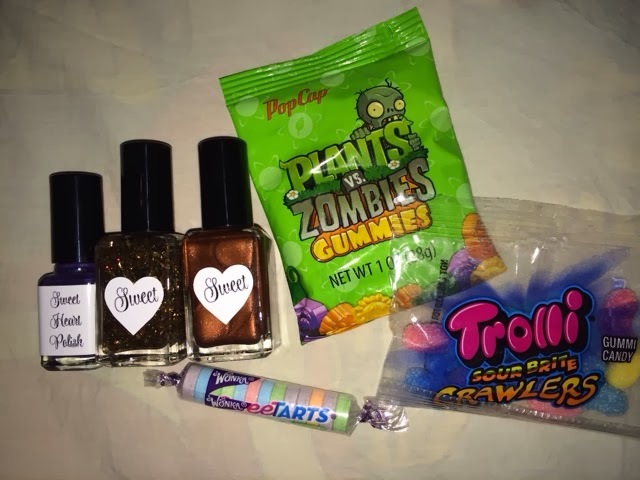 Once again, I would like to thank Cassandra from Sweet Heart Polish for the gift and participating in Colorsutraa's giveaway. 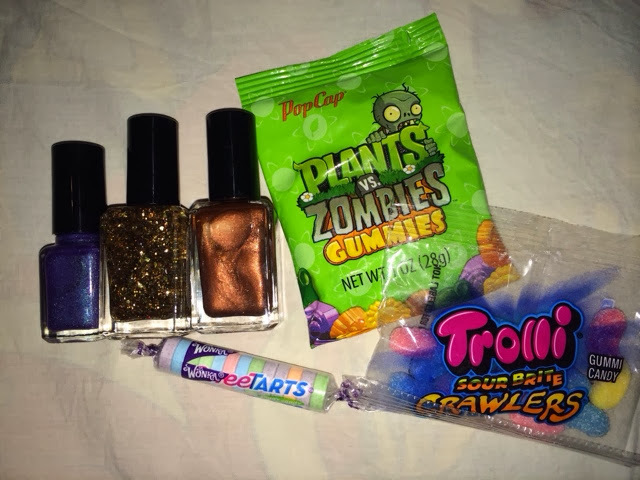 Also, to Colorsutraa for hosting this amazing giveaway! Be sure to support and follow this two amazing ladies on their accounts!